This was so for handsome Nissanka Wijeratne who had just returned to Sri Lanka from the UK and who was at the Kegalle sports grounds where the coronation ceremony of Queen Elizabeth 11 was being held. Just 28-years old the young prince had still not found his Cinderella. Nissanka recalls what his mother said before he left their UK residence where his father Sir Edwin Wijeratne was the High Commissioner for Sri Lanka. 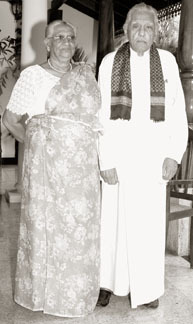 Lady Leela Wijeratne had already arranged for her son a marriage proposal. "This should be the first thing you do once you return to Sri Lanka," Nissanka remembered his mother's command. So he was heading to Kurunegala to see his prospective bride. On the way he stopped at the Coronation ceremony at the Kegalle Sports Club as he liked the company of his colleagues who had also joined the get together. Nissanka roamed around and stopped at a rose bed on the grounds. This was the time to do the right picking - plucking the right flower from the bunch of flowers in the world of rose beds. He beamed touching one of the beautiful roses. Nissanka raised his head sensing some strange feeling. His eyes caught a good looking 'Kumarihamy' who was also beside the rose plants. The bashful maiden who saw a princely young man looking at her quickly looked the other way. But Nissanka didn't feel like giving up. "Hello, I'm Nissanka Wijeratne," he introduced himself. "Nice to meet you. I'm Nita Dullewe." she didn't know how she managed to say, "Excuse me!" and the next minute she had vanished. Nissanka was bewildered. This was the first time a girl had evaded his attractive eyes. That evening, Raja Seneviratne, a planter arranged a dinner for the distinguished invitees. Nita had come there with her father. There too the young administrator tried to have a word with the 'Kumarihamy', but she somehow evaded him. Early the next morning, Tinny (Thilakaratne) Dullewe had a visitor. He was delighted to see Raja Seneviratne, his friend who threw the dinner party on the previous day. "Why Raja, why so early?" he asked. Tinny was astonished when Raja said he came to get Nita's horoscope. When Nita heard that the young prince eyeing her the whole of yesterday had asked for her hand, she at once came out with what she really felt about him. "Appachchi, he looked like a married man. Are you sure about this?" she asked. Tinny Dullewe laughed. Nita was his and his wife Mallika's only child who was born after 6 years of their marriage. For Tinny and Mallika, Nita was a sacred child as they got her after offering many poojas to Dalada Maligawa, Kandy... After her they didn't get any other children. Now Nita was 21 years. But for Tinny she was still the little 'Chooti Kumarihamy' who used to bounce on his lap for hours worrying him to recite one story after another. Tinny patted her head. "I have been knowing Nissanka since he was in his shorts. He is coming from a good family too. Also, do you think that I would give you away to a married man?" when Appachchi said so Nita smiled contentedly. 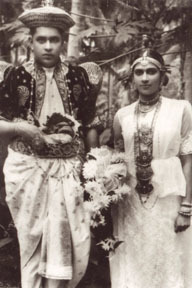 In a grand wedding held at Meeduma Walawwa, Rambukkana, at the Dullewe's residence, Nissanka and Nita entered blissful wedded life on December 10 in 1954. So they are celebrating their 52nd wedding anniversary today. The loving couple still has many things to share with each other - laughter, a sense of humour and of course passion. Let's zoom back to their wedding. The catering for the Meeduma Walawwa was done by the Queens Hotel, Kandy. Governor General of Ceylon Sir Oliver Gunatillake and Mr. B. Ratwatte (father of Premier Mrs. Sirimavo Bandaranaike) were the attesting witnesses for the groom and the bride respectively... "It started raining and continued the whole day. But everybody said it was a good sign," recalls Nita. "I was very much attached to my father. It was unbearable to be away from Appachchi. So I couldn't stop my tears even when we were proceeding to Haggala for the honeymoon. He (Nissanka) tried to console me, and at the end he said, 'Andala Evara Unama Ekkegena Ennam. Dan gihin apahu aralavannam' (Shall I drop you back and come to fetch you when you have stopped crying?). He was not harsh, but, I thought I better stop crying," she laughs. 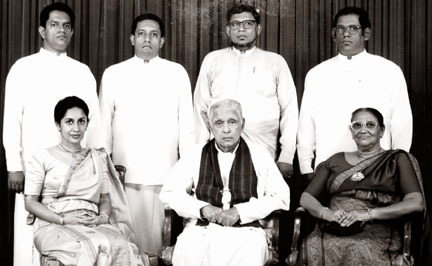 Nissanka and Nita were blessed with four sons and a daughter- Neranjan (former Diyawadana Nilame) , Manodha (MP - Dedigama ), Anuradha (former Provincial Council), Lankesh and Nishanganie... "I was one month pregnant when we went on a Dambadiva pilgrimage. When we were crossing the Neranjana river to see the place where Princess Sujatha offered 'Kiri Pindu' to the Buddha we decided to name our first born child 'Neranjan'. Also Neranjan was born in the Kandy Nursing Home at the very moment when the main Randoli Perahera went back into the Maligawa after proceeding in the Kandy town. The Matron told me that she heard the sound of the crackers which indicated the event. So, Neranjan also became Diyawadana Nilame of Dalada Maligawa twice. It was a great pleasure to think that to be the wife and the mother of the Diyawadana Nilame of the great sacred tooth relic," she smiles. Nita seemed to be the only lady who got the opportunity to get blessed with the main Dalada Karanduwa kept on her head four times by three of her blood related Diyawadana Nilames. First when she was a little girl- by her grand uncle, Harris Ratwatte; Secondly by her husband Nissanka Wijeratne and twice by her son Neranjan Wijeratne. Nissanka Wijeratne was born on June 14 in, 1924 in Colombo (though he hailed from Kegalle). His father was a State Council Sir Edwin Wijeratne, a Cabinet Minister of D. S. Senanayaka government who later became a High Commissioner for UK and India. Lady Leela Wijeratne (nee Pethiyagoda Kumarihamy) from Kandy was his mother. Nissanka was a very bright student at Royal College, Colombo. He was a great giant in the civil service who rendered his service to the general public, the country and government ministries by holding many top ranks. He was honoured with a doctorate by the University of Colombo in 1978. Nissanka retired from the Government Administrative service in 1973. And in 1975 he contested for the Diyawadana Nilame (DN) post of the Dalada Maligawa, Kandy, and won it by a landslide victory. It was the first ever in history that the Kandyan Radala caste hierarchy was challenged for that post. Although Nita hailed from Radala caste, Nissanka was a Kandyan Govi Gama. However Nita worked hard for Nissanka's victory. The service that Nissanka rendered in his high office of DN to the Dalada Maligawa was immense and gigantic. Dr. Nissanka Wijeratne is a man of great versatility. In his public life, he displayed wisdom with humour. Once Prof. Carlo Fonseka had introduced him as a scholar, poet, politician, ambassador and prestigious civil servant. His prodigious memory seems to be improving with age. His passion for history and religion blended into a transcendental interest in the higher values and spiritualism, which are reflected in the verses collected in his 'Ape Appachchi', a collection of his poetry which was published by his ardent children on his 77th birthday. The President's Fund was his idea that President J. R. Jayawardane activated. The Sri Lanka Cultural Triangle, Ruhunu University and Open University, President's Colleges all over the island and the New Superior Court Complex in Colombo were among the proposals of this mastermind that were activated later on. "One day when time of me takes toll/ Remember I truly loved you with my heart and soul..."